Vampirina is coming to Disneyland and Walt Disney World this week! Beginning today, Vampirina is beginning meet and greets at the Disneyland Resort for its annual Halloween Time celebration. She will offer meets in Disney California Adventure and will make appearances in the “Frightfully Fun Parade” at each Mickey’s Halloween Party. Additionally, she will begin appearing at Mickey’s Not So Scary Halloween Party for the Disney Junior Jam dance party in Storybook Circus. Her first appearance will be Sunday, September 9. She will also be included in the Mickey’s Boo to You Halloween Party. She is still supposed to begin offering meet and greets at the Disney Jr Breakfast at Hollywood and Vine later this month as well. 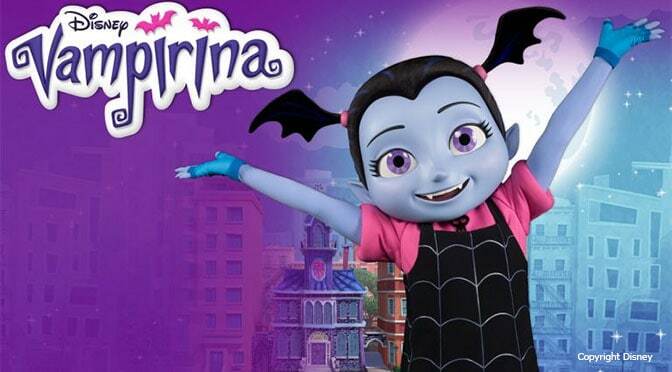 Are you excited to meet Vampirina? She will not be at Hollywood and Vine until September 30. :( We leave the 29th. Has anyone been booted from the Courtyard yet? I’m thinking Jake or Sofia?? Kenny – You just made this mama super super happy! I can’t wait to NOT tell my daughter so she’ll be surprised since we already gave her the “Vampirina won’t be there” talk! Any word on whether she will be meeting in Animation Courtyard also along with the other characters from the Hollywood & Vine breakfast? My question too! I hope so. We don’t go until January so plenty of time for that to happen.